Rare is the opportunity to see, much less own, an original. 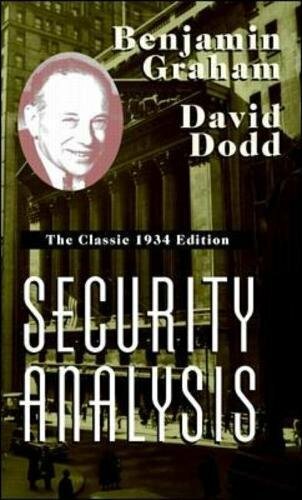 But this unusual, carefully crafted reproduction of Benjamin Graham and David Dodd's immortal Security Analysis gives you that chance--to read and treasure a true classic--the book that gave birth to value investing. Continuously in print through five editions, for more than 60 years, and through nearly a million copies, the primer for many of America's most illustrious investors--and the wellspring of Graham and Dodd's Wall Street Immortality--Security Analysis is indisputably the most influential book on investing ever written. Still the investors' bible, it's as frequently consulted today as it was when it first appeared in 1934. The original words of Benjamin Graham and David Dodd--put to paper not long after the disastrous Stock Market Crash of 1929--still have the mesmerizing qualities of rigorous honesty and diligent scrutiny, the same riveting power of disciplined thought and determined logic that gave the work its first distinction and began its illustrious career. But this reproduction is far more than a historical curiosity, an interesting object, and a delightful read. It presents the original Graham/Dodd method of investing--told in their own words as they first described it in the 1930s.